Paliostafida Kefalonia: Paliostafida is one of the least known beaches of Kefalonia. 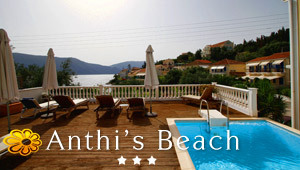 It is located only 3 km from Argostoli, the capital of Kefalonia. This is a small yet fully organized beach with umbrellas and sundecks. It is surrounded by steep cliffs covered with vast greenery, tall pine trees and various plants. The water is clean and shallow, ideal for children. The limited length of the sandy beach doesn't allow many beach games or other activities. Despite the short distance from the town, Paliostafida remains still unknown from many visitors and Greek travelers.